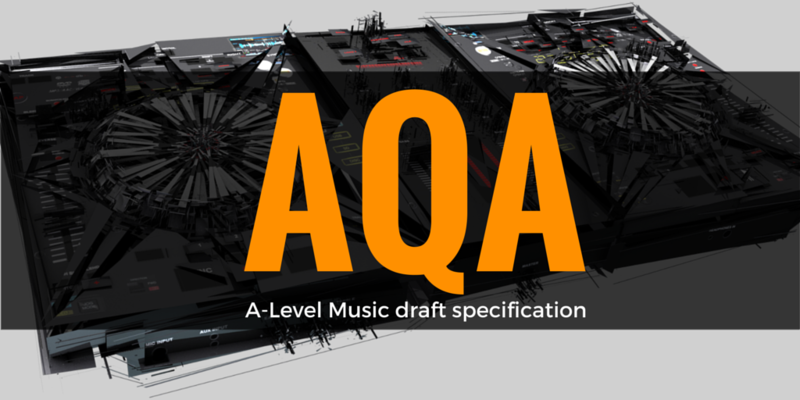 I recently wrote a series of posts about my first reaction to each of the draft specifications for GCSE Music that the exam boards published last month. Starting today, I’m going to be continuing that series with a look at the A-Level specifications. As with the GCSE series, the intention is not to write a comprehensive overview but to give a first impression perspective. Equally, the sole focus of these posts will be on the A-Level course rather than the separate AS specifications, which I will look at in a future blog series. First up is the new AQA specification. The de-emphasis of composition is interesting and will appeal to teachers who worry about the subjectivity of marking when it comes to this particular skill. It’s also nice to see that all three units are externally examined, which has the potential to be a very slightly decrease in workload for some music teachers. I must admit that I don’t really like the name ‘pop music’ for an area of study rather than (the probably more accurate) ‘popular music’. ‘Pop music’ just’ feels so flippant but perhaps I should relegate that whinge as a personal preference. The western classical tradition area of study is quite tightly defined, looking at solo concerto, Mozart’s operas and piano music of Chopin, Brahms and Grieg providing a Baroque, Classical and Romantic focus respectively. A list of set works is also provided, lending some clarity of expected study. Rather than sticking with set works, the other areas of study provide a list of set of artists/composers that students must be familiar with. As with the GCSE, there is a very clear outline of vocabulary that students will be expected to be proficient with and this is another level of clarity that will be quite welcome. I found it interesting that sections A and B will allow students to “access their own excerpt relevant to their excerpts digitally and control how many times they hear each excerpt in order to answer the question”. I will be interested to see how this works in reality. Will this be an innovative approach with some sort of online assessment or the more familiar take of students having individual CDs (and requiring individual CD players). Either way, many teachers will need to adapt how they teach exam technique for this particular unit. The performance unit requires that candidates perform 10-12 minutes of music between 1st March and 31st May in the year of certification. For centres accustomed to taking advantage of ‘performing throughout the course’ structures, this will require some adaptation and schemes of work will need to take this into account. Centres who have typically assessed performance through a ‘performance exam’ towards the end of the course may find that they are already well prepared. I was interested to note a line in the specification regarding performances that come in under the required ten minutes. This stands in really quite stark contrast to an approach that simply deducts marks on a sliding scale depending on the extent to which candidates have fallen short of the required time. A great deal of precision will need to go into the planning for this aspect of the course. The technology pathways through this unit are well defined and it’s interesting that the ‘solo’ technology option states that the minimum requirement is one audio and one MIDI track while the ‘ensemble’ option requires that at least five tracks be performed by the student. I think that teachers deserve more in the way of clarification for exactly what this means and I sincerely hope that the board will provide an abundance of exemplar recordings and session folders so that teachers can really get to grip with the expectations. No great surprises here, aside from the light weighting in comparison to performing. Two compositions are to be submitted, one of them in response to a brief set in the year of certification (as per Ofqual’s requirements). The total duration of the two compositions combined is 4mins 30secs to 6mins and, similar to the performing unit, the specification makes it clear that portfolios short of this “will not be accepted as assessment evidence”. I can see some candidates being caught out by this and I’ll be interested to see the steps AQA takes to keep this requirement clear in the minds of teachers delivering the course.